Cleveleys Masonic Hall was the location for the proclamation of Mel Howarth. Mel had graciously agreed to carry the baton of Spartan Lodge No 8048 for another year to allow the lodge time for other brethren to progress. The brethren and guests were extremely pleased to have as its principal guest Past Assistant Provincial Grand Master Harry Cox. Harry was supported by Duncan Smith and North Fylde Group Chairman Peter Greathead and his team of group officers, Tony Farrar, Jim Gregson and Glen Jackson, not to forget the brother behind the lens, Peter Dunn. 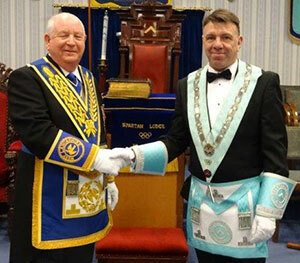 Mel showed why he was such a good candidate to fill the chair of King Solomon for a second year by completing the administrative business of the lodge in fine style and moving to the second degree at which time the lodge’s director of ceremonies Alan Barnes retired. Mel then swiftly opened to the third degree, when Alan returned to herald the presence of Harry Cox. Once Harry was formally welcomed to Spartan Lodge, Mel invited Edwin Fisher to act as installing senior warden, Derek Abbott to act as installing junior warden and Neil Kirkpatrick of Norcliffe Lodge No 7371 to act as installing inner guard. There was a short period of reverence in respect of a stalwart of the lodge Alan Whitehouse who passed away. It was then time to start the ceremony of proclamation in the safe hands of Alan Barnes. Harry Cox (left) presents Mel Howarth with the MCF 2021 Festival Patron’s Certificate. 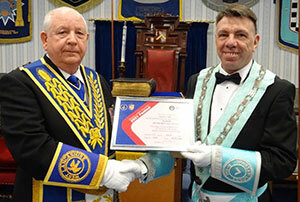 The third degree working tools were delivered by Brian Purdie. Ken Hoskins delivered the second degree working tools leaving Jon Moss, the lodge’s senior warden, to deliver the first degree tools, with Harry Cox delivering the final address, that to the brethren of the lodge, with dedication. Once the officers were invested and Alan Barnes gave the final words to conclude the ceremony of proclamation, Harry rose to bring the greeting of Provincial Grand Master Tony Harrison to Mel and all the brethren of the lodge. Mel then presented Harry with cheques for £2,000 to the 2021 Masonic Charitable Foundation, £250 to the National Autistic Society and £250 to the Trinity Hospice in respect of Alan Whitehouse making an amazing total of £2,500. Harry added that he was struck by the generosity of a small lodge of only 10 members and it was a great honour to present Mel and the lodge with their Masonic Charitable Foundation 2021 Festival Patron’s Certificate. In response to his toast, Harry congratulated Mel and his officers and in particular Alan Barnes his proclaiming master. Harry wished Mel good health for the coming year and hoped that he would get out and visit. Harry thanked Peter Greathead, Tony Farrar and Duncan Smith for all their hard work within the group. Progressing on, Harry spoke about the work of the West Lancashire Freemasons’ Charity and their support for such items as the blood bikes and paying for the provision of prostate cancer screening at Provincial Grand Lodge. Harry moved to the MCF 2021 Festival and said how important it was to support it and contribute through purchasing a jewel and using the white envelope scheme. Picture left: Harry Cox replying at the festive board. Picture centre: David Rowbotham (left) performing the master’s song. Picture right: Harry (left) receives flowers for Carol from Mel Howarth. Harry spoke about the North Fylde Masonic Bowling Tournament that will be held at Cleveleys Masonic Hall later in May and that the organisers are going to hold a fun event for those who are interested to have a try. Harry completed his response by passionately promoting the benefit of membership of the Royal Arch, saying that it was a wonderful degree to be involved in and it was an important step to complete a Mason’s Masonic journey. Pictured from left to right, are: Glen Jackson, Jim Gregson, Peter Greathead, Harry Cox, Mel Howarth, Duncan Smith and Tony Farrar.